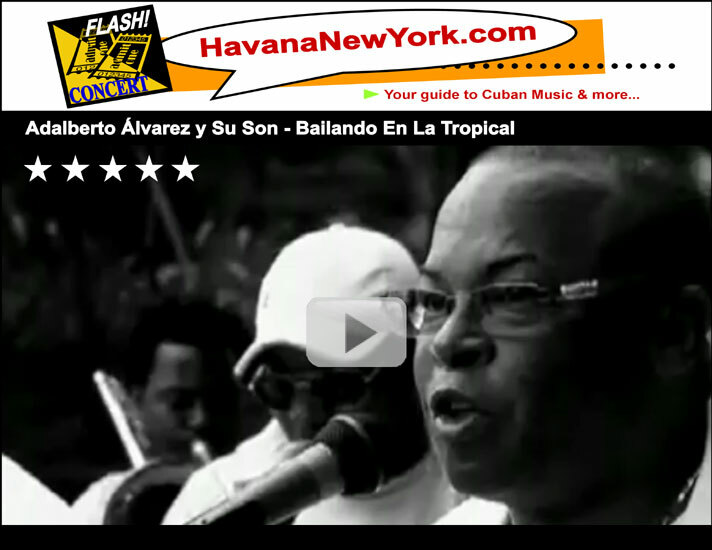 Adalberto Alvarez founded in 1978 "Orquesta Son 14” becoming a landmark within those existing in Cuba showing a different musical concept, because, using the Son`s roots, it renovated it through texts, orchestrations and contemporary harmonies. Later on, around 1984, he created his "Adalberto Alvarez y Su Son". This orchestra is the one that, besides maintaining the primacy in the genre, assumes the challenge of creating new harmonic and rhythmic changes to faithfully satisfy the dancer. The incredible cadence reached in stage, was also recognized by overseas dancers. Creations by Adalberto appear in the repertoire and discography of such luminaries as Papo Lucca, Oscar D' León, Roberto Roena, Willy Rosario, Andy Montañés, Ismael Quintana, Juan Luis Guerra and the 440 and Eddie Palmieri among other excellent salseros who has admitted his talent as composer. The above mentioned is just an example of Adalberto Alvarez`s great significance as composer, however, his live performances also shows interesting events with the public, such is the case of the concert celebrated on April, 2002 at the Paris` Congress Palace where "El Caballero del Son" invited the veteran Compay Segundo, more than 4000 persons attending this performance could witnessed the incredible success achieved by the Adalberto's Son. It is just in 2003, when Master Adalberto Alvarez saluted his 55 birthday, 30 anniversary of artistic achievement and 25 years of the song recording that launched him to fame as an internationally-renown composer: A Bayamo en Coche. In the middle of these celebrations and with the joy of having received the 2003 Cubadisco Special Prize, Adalberto featured his "Para Bailar Casino" CD, recorded via Bis Music label at Salón Rosado de La Tropical aimed at rescuing the dancing in couples. It is also the theme Para Bailar Casino the motivation work for a TV program made this summer having the contribution of some orchestras and Ruedas de Casino alive. This TV project was an Adalberto-Victor Torres's idea, the last one underscores as one of the most prominent director of Cuban TV musical programs.